Sam’s Club offers perks for MSU employees with new or continued membership. Join or renew your Sam’s Club membership and receive a $10 gift card and $45 in instant savings. 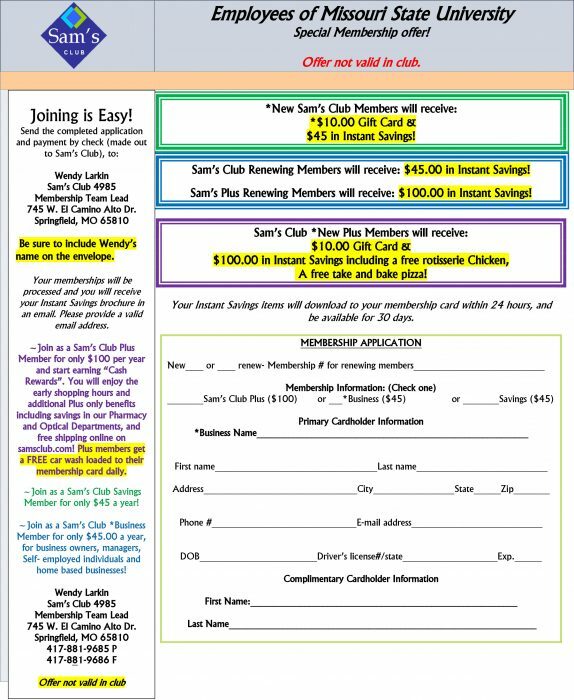 Download the Sam’s Club form, complete it, and return it via mail. Be sure to put Wendy’s name on the envelope. This offer is not valid when presented in the store. Your instant savings card will be emailed to you. This offer is good for new and continuing memberships. For more information, call Wendy Larkin at 417-881-9685. Below is the form that needs to be printed and mailed.